Bruxzir High Strength Crowns - Michigan City Dental, P.C. | Michigan City Dental, P.C. 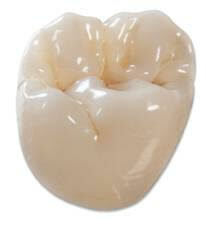 Bruxzir is the type of porcelain from which the pictured crown is made. This super strong porcelain is 10 times stronger than the porcelain crowns of the past. It is great for people who have experienced broken crowns, or for those who grind their teeth and are wearing them away. The technology that goes into making this porcelain is astounding! Watch the video see that you can take a hammer to a Bruxzir crown and it won’t damage it!